No commitment necessary to ask questions. ​What is live painting and why do I want it at my event? Live painting is an improvisational performance in which a visual artist creates a painting in front of a live audience during the duration of an event. A live painting performance artist creates the artwork from start to finish as a method of entertainment. Unlike purchasing a piece created in the artist's studio, a live painting session includes the whole performance from start to finish. It is a way to engage your guests and create fantastic memories. Why choose you to perform at my event? I am a long-time artist and love to entertain! I engage the audience, welcoming questions and comments, and help create a fun and creative environment at your event. For fundraisers, I help promote your cause with advertisement and conversation about your purpose. 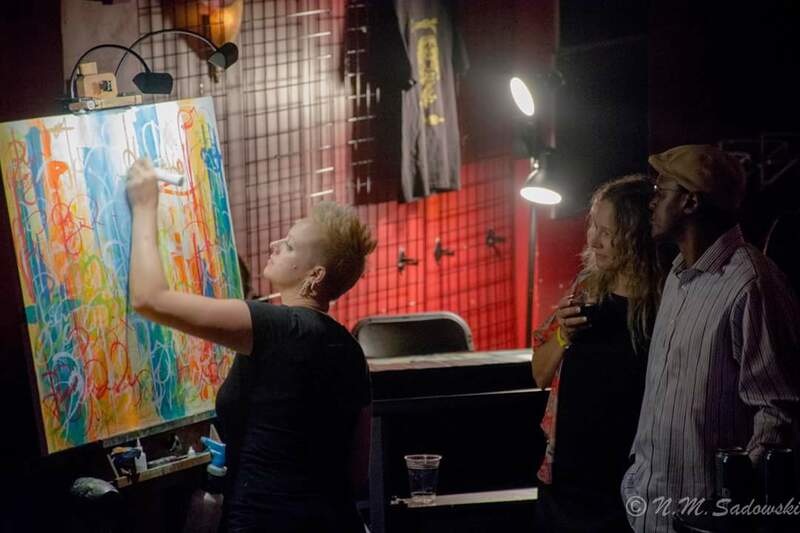 At concerts, I paint with the music, encouraging your audience to really get involved in the moment and the movement. I am very personable and quick to make your guests feel comfortable at your event, and help create a more involved environment for everyone. If you choose to have a guest win the finished piece, this creates even more incentive for guests to stay and enjoy the whole event. Is it ok to talk to you while you paint? Absolutely! I always welcome onlookers, conversation, and questions. I am accustomed to answering questions during my sessions, if the situation permits. Certain circumstances, such as being up on stage away from the crowd, obviously do not make for a conversational performance. I am there to entertain, to have fun, and to engage when I am able. However, please be respectful of the situation. If I seem very involved in the piece and am not able to pause, please be patient. I will answer questions once I have a moment to step away from my work. If I need to return to the work while we’re talking, please take no offense. I’m simply trying to keep the momentum going and to finish the piece in my allotted time. Do I need to provide anything for you to paint at my event? A minimum space of 6'x6' and a nearby outlet are typically the only requirements. I provide all basic live painting related materials including an easel, canvas, paint, brushes, palettes, drop cloths, lights, and a small table for my materials. Any other accommodations can be discussed during your consultation. Does the paint smell, and will we need to clean up anything? No. I use low-odor acrylic paints and inks, and provide my own drop cloths to protect your surfaces from any spills. In the event that a spill does occur, I act quickly to ensure that any mess is cleaned up. Please contact me if you have specific concerns about your space, and I can adjust my preparation accordingly. What happens with the finished piece? Before your event, we will decide whether the finished piece is intended to be auctioned off, won by an event attendee, donated, sold, kept by the host, or goes home with the artist. In most cases, the piece is finished and ready to hang the same day as the event, which makes handing it off to the owner quite simple. You can choose to auction off the piece at your fundraiser through a silent auction or raffle. If you'd like to auction or raffle the piece, please let me know so I can come equipped with the appropriate materials. This is a great way to gain more income for your cause! Contact me to discuss your event. Price range varies, but I am always accommodating to various budgets. Some instances may warrant a cost-free performance.